This always shakes darts fans to the core but you could just pick and choose your events. Not as much fun as proposing the merciless destruction and flamboyant rebuilding of every event on earth but a practical solution if something is not to your taste. These aren't the old days where you'd not see a match between January and July and got into the habit of lapping it all up. Everything is doing its work, with or without you. and of course very few people are as weird as us weirdos. If you don't have Sky and don't use streams, you'd be excited for the Masters every year and your next lot will be the UK Open. I don't get the mentality of people that slags off the event before it starts, then watch it, then slags it off after it has finished and say it is a pointless event. 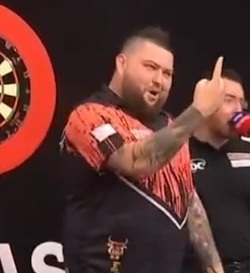 I like watching any darts event on TV or stream, I have favourites and am not so excited about others but I watch them because I like watching darts.. the first event of the calendar is always going to be a bit ropey, due to the players coming back after a month or so off, and also being an unranked event, but I still enjoy watching it.. I am looking forward to the start of the PL and the Uk Open but there will be many people sagging them off before they even start. Maybe they are looking for permission to break the cycle and stop watching completely. We could set them free. All I watched of The Masters was part of the 1st session and the last session, and even that I was barely paying attention to. I will try and go cold turkey next year. Yeah, even an event like this is better than nothing I guess, darts is still better than no darts! Still won't stop me and the others on here from offering some astute suggestions to Hearn, even if he has no intention of listening to a bunch of absolute nerds on a forum! Anyway I think the criticism is perfectly valid. It would be hard to find a darts fan who doesn't think the Masters is one of the most irrelevant events on the calendar. Yes it's still better than nothing I suppose but to me it's a massive opportunity for the PDC to do something creative and/or more meaningful, and they miss that opportunity every year.